SnapSports® Athletic Surfacing is the official sports flooring of AAU Jam On It’s Las Vegas Desert Jam Tournament, set to take place at the Tarkanian Basketball Academy, May 11-12, 2013, in Las Vegas, Nevada. 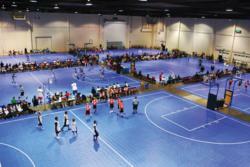 This AAU Jam On It tournament will showcase boys and girl’s teams, grades 4th – 12th, playing in this Southern Nevada Qualifying Basketball Tournament Series for the West Coast National Championships held in Las Vegas, July 18-21, 2013. The event will include a mix of teams, both local and out of town, and all teams participating in this series will receive a three game guarantee, with trophies and medals being awarded for 1st and 2nd place. SnapSports® Athletic Surfacing, is the top rated modular sport flooring in the industry. The multi-patented BounceBack® surface offers superior traction and durability, while the multi-patented ShockTower® technology uses an understructure composed of sixteen individual shock absorbers to offer superior shock absorption, easing the impact on players joints, allowing them to play longer today and for years to come.